Bihar Polytechnic 2019: Bihar Polytechnic exam is also known as Diploma Certificate Entrance Competitive Examination (DCECE). Every year it is organized by the Bihar Combined Entrance Competitive Examination Board (BCECEB), for admission to various polytechnic courses in the engineering & non-engineering field. 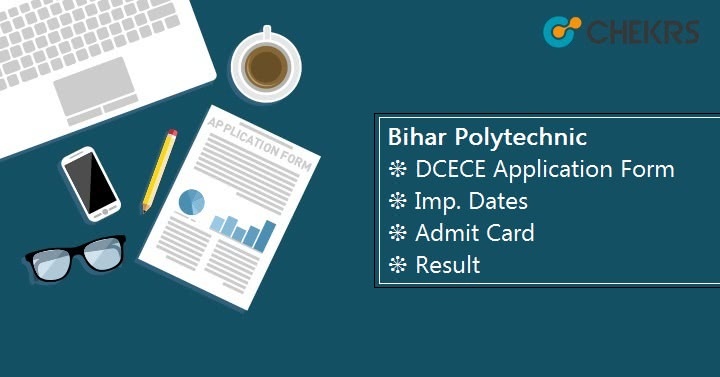 All the Interested candidates can get complete details about Bihar Polytechnic (DCECE) 2019, DCECE Application Form, Important dates, and events from this article. Bihar Polytechnic exam is a state level examination, Bihar Polytechnic 2019 exam will be conducted for admission in various professional courses in domains like Paramedical (PM), dental (PMD), polytechnic engineering (PE), polytechnic non-engineering (PNE), and part-time polytechnic engineering (PPE), in different Engineering colleges, Agriculture colleges, and Medical colleges under the Govt.of Bihar. Offered Programs: Various Polytechnic courses in the engineering & non-engineering field. The Bihar Polytechnic Exam usually happens in May-June every year. Tentative dates of Bihar Polytechnic exam 2019 are here. Make sure to read the Bihar DCECE 2019 Eligibility criteria very carefully because if you are not eligible then you will face problem at the time of filling the DCECE Application form. All the Candidates must be the resident of India. Candidates who are applying for DCECE 2019 PE examination should have Passed 10th or its equivalent examination with minimum 35% qualifying marks. Candidates who are applying for DCECE 2019 PPE examination should have “Passed 10th with two years ITI or two-year experience”. They should have the minimum 17 years of age. Aspirants who are applying for PM examination should have Passed 10+2 with PCM/B & English subjects. or it’s equivalent examination. They should have age between 17 to 35 years( as on Dec 2019). Candidates who are applying for DCECE 2019 PMD Exam should have passed 10th or its equivalent examination with Physics, Chemistry, Biology and English subjects, from CBSE/ICSE & recognized board. Their age has to be between 15 to 30 years (as on Dec 2019). Appearing candidates can also apply for DCECE 2019. DCECE application form 2019 will be issued in the fourth week of February 2019. It will be issued through online mode by the board through on the official website. All the Interested Candidates can fill the Bihar Polytechnic DCECE Application Form in between the 4th week of February 2019 to 4th week of March 2019. Education details and Personal details. Email id, Mobile no, Aadhar Card. Scanned passport size photograph (Less than 100KB). Scanned signature (Less than 100KB). Debit card or Credit card or Net banking facility for Fee payment. Now find DCECE option on the left side of the website. Now on the next page Under Advertisement:- DCECE-2019, There will be a link containing the text “Apply for DCECE (PE/PPE/PM/PMD)-2019” Click on It. On the next page, you have to register yourself on the website by entering email ID and valid mobile number. After registration, Login to your account, using the registration number (user ID) and password by click on Sign In. Now you have to Pay the application fee. So pay the DCECE Application fee via any of the available modes of payment. After successful payment, “Fill the Personal Information” link will appear. Click on It. On the next page, upload your photograph and the signature in Hindi. After it, provide your education information via “Fill the Educational Information” link. Preview your already filled DCECE application form for errors and mistakes. Click on the final Submit button after reading the declaration. After everything, Download and print out Part-A and Part-B of the completely filled application form and send it to the official authority. The application fee is 880/- for Paramedical. SC/ST candidates have to pay Rs.500/-. The application fee is 770/- for PMD. SC/ST candidates have to pay Rs.440/-. The application fee is Rs. 660/- for PPE. SC/ST candidates have to pay 385/-. The application fee is 550/- for PE. SC/ST candidates have to pay Rs.330/-. The DCECE exam pattern varies course to course. All the papers will carry 90 questions but subjects will be different. Here are the complete details of exam pattern. Exam paper (Offline)will have total 90 questions of 450 marks from Physics, Chemistry, and Mathematics subjects. Each question will carry equal 5 marks. The duration of the examination will be 135 minutes= 2hours 15 minutes. There will be 30 questions from each subject. The exam will happen via offline mode, Exam paper will have total 90 questions of 450 marks. The Question weight will be as below. DCECE 2019- PMD Exam paper will have total 90 questions of 450 marks and will be in Offline Mode(Pen-Paper). The Bihar Polytechnic 2019 syllabus varies course to course. The syllabus will be different for different courses. For PE & PPE, All the Candidates have to study physics, chemistry, and mathematics subjects of 10+2 syllabus. For PM, Aspirants have to study General Science, Numerical Ability, Hindi, English and general knowledge. For PMD, Candidates have to prepare physics, chemistry, mathematics, Biology, Hindi, English, and general knowledge. All the candidates who filled the DCECE Application form will get the admit card in the fourth week of May 2019.Bihar DCECE 2019 Admit Card will only be issued online on the official website. After the release of admit card, All the candidates can download the admit card by using their “Date of Birth & Registration Number “or “Registration Number and Password”. “Download Admit Card of DCECE[PE/PPE/PM/PMD]-2019”. Click on it. On the next page, you will find a link with the text “Download your Admit card by Registration No. and Date of Birth: Click Here” Click on Click Here. That’s it, You will get your DCECE 2019 Hall Ticket using the above procedure. The exam authority will release the answer key online after two or three days of the examination. There will be separate answer keys for each group of courses such as PE/PPE & PM/PMD. Candidates can check or download DCECE Answer Key PDF format. Answer key will help candidates to calculate their rough marks using the Answer key. A few weeks later, the result will be declared by the exam authority. Bihar Polytechnic 2019 result will be announced through online mode only. All the Candidates can check their DCECE Result 2019 in the 4th week of July 2019. The Exam result probably will be in PDF format so candidates have to search for their roll number to know their result. Qualified candidates will get the date, time and venue for counseling/interview in the same result card, According to their courses. A rank card will be also provided online, and as per their rank card and category, Candidates will be called for Bihar Polytechnic Counseling Process. The rank card will be available online in the month of July 2019. Candidates have to download their rank card to appear in the counseling process. The counseling will be organized from the last week of July 2019, through Offline mode. On the day of the interview, the documents will be verified and candidates have to fill choice of colleges and courses as per their preferences. After it, seats will be allotted to qualified candidates, on the basis of rank, availability of seats, filled with choices, category, etc. In this Bihar Polytechnic Seat Allotment process reservation of seats as per category comes into action. SC category has 16%, ST category has 1%, EBC category has 18%, backward casts have 12%, and RCG category has 3% reservations. So final admission process will be started after the final seat allotment and document verification process. Bihar Polytechnic Exam or Diploma Certificate Entrance Competitive Examination (DCECE 2019) is a great opportunity for the aspirants who want to take admission to various polytechnic courses in the engineering & non-engineering field. If you are interested to make a good future through polytechnic Go for it, but before going too far please fill the application form before the due date.